Prior to April 2015, Colorado did not identify cyberbullying in state harassment laws. It was only after Douglas County high school student Kiana Arellano attempted suicide in 2013 that the state Legislature took steps to protect children from cyberbullying. House Bill 1072, known as Kiana Arellano’s Law, makes it illegal for a person to harass another using various “interactive electronic devices” or on social media sites like Facebook and Instagram. This behavior is a criminal misdemeanor punishable by up to $750 and six months in jail. More recently, the Claire Davis Act, named after a Colorado teen who was shot and killed at school in 2013, amended the Colorado Governmental Immunity Act, effectively dismantling governmental immunity for schools that fail to exercise “reasonable care” in guarding against incidents of violence at school. Monitoring and punishing student harassment or cyberbullying has historically been the responsibility of schools and parents, not the courts. But in recent years, several cases of online teen harassment and suicide have spurred parents, school administrators, and legislators into action. Parents should know that in addition to criminal charges, offenders, parents and/or legal guardians (and now school districts) can be held responsible for “serious bodily injury” of a student. 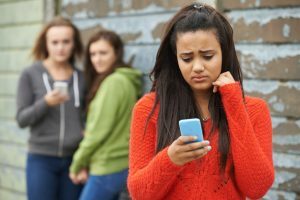 If you suspect your child is a victim of cyberbullying in Colorado, call local law enforcement then contact the attorneys at The Frickey Law Firm. For example, the Claire Davis Act says schools may be liable for up to $350,000 for any injury to one person in any single occurrence and $900,000 for an injury to two or more persons in any single occurrence. The school must prove they took proper and necessary steps to prevent violent acts. Parents of teen perpetrators may also be held liable in cases that don’t meet specific criteria in school liability claims. To that end, when cyberbullying occurs at home or off-campus, courts have denied liability claims against the school but permitted them against the parents of the offender. These cases usually involve common tort claims like harassment, defamation, libel, or intentional infliction of emotional distress. An experienced Colorado personal injury attorney can file and pursue a claim like this. Above all, if your child is a victim of cyberbullying or online harassment in Colorado, call police to report the crime immediately. Instances of cyberbullying or online harassment are extremely complicated, and defensive actions may be slowed by various legal obstacles. Even with the aid of police and support from the school, some cyberbullying cases may require further legal action. It may be necessary, for example, to work with an attorney to obtain a court order restraining the cyberbullying or other dangerous behavior. Victims may also consider filing negligence per se charges against the offender. Negligence per se is an act that is considered negligent because it violates a state statute or regulation explicitly (e.g. Kiana Arellano’s Law or the Claire Davis Act). Colorado victims can sue offenders, parents, or legal guardians in civil lawsuits for damages including medical bills and emotional distress. Moreover, if a school knows a student is victimizing others and takes no action, the school may be held liable for damages as well. If you or your child is being bullied online, contact the Denver injury attorneys at The Frickey Law Firm for a free consultation to help you understand your options. Bullying is a problem youth often choose to face alone. Cyberbullying is not reported more than half of the time. According to the Cyberbullying Research Center, approximately 25 percent of middle and high school students have experienced cyberbullying. The abusive behavior is cyclical too. Sixteen percent of those students admit to cyberbullying someone else. Every day, more than 160,000 kids stay home from school to avoid bullying; approximately 4,400 youth suicides (ages 10-24) are recorded every year; for every suicide, there are approximately 100 suicide attempts. Today, suicide is the third leading cause of death for people ages 10 to 14 and second leading cause of death for people between the ages of 15 and 34. Wrongful death claims can be filed by families who have suffered the loss of a child who was bullied with electronic devices or on social media. Futhermore, cyberbullies may also face criminal charges. Michelle Carter, for example, was recently convicted of involuntary manslaughter in a Massachusetts court for successfully encouraging her ex-boyfriend to kill himself via text. She faces up to 20 years in prison. Students, regardless of race, religion, gender, sexual orientation, or economic means should be free from online prejudice or ridicule. With the expansion of Colorado harassment law to include cyberbullying, and without governmental immunity for schools, it’s hard to say what the Colorado legal landscape will look like in future Colorado cyberbullying cases. For now, parents should remain vigilant and monitor children’s online and offline behavior closely; look for signs of bullying or victimization, to prevent children from cyberbullying. Stay up-to-date on Colorado cyberbullying trends and important cases. Like the Frickey Law Firm on Facebook or follow us on Twitter to stay informed!